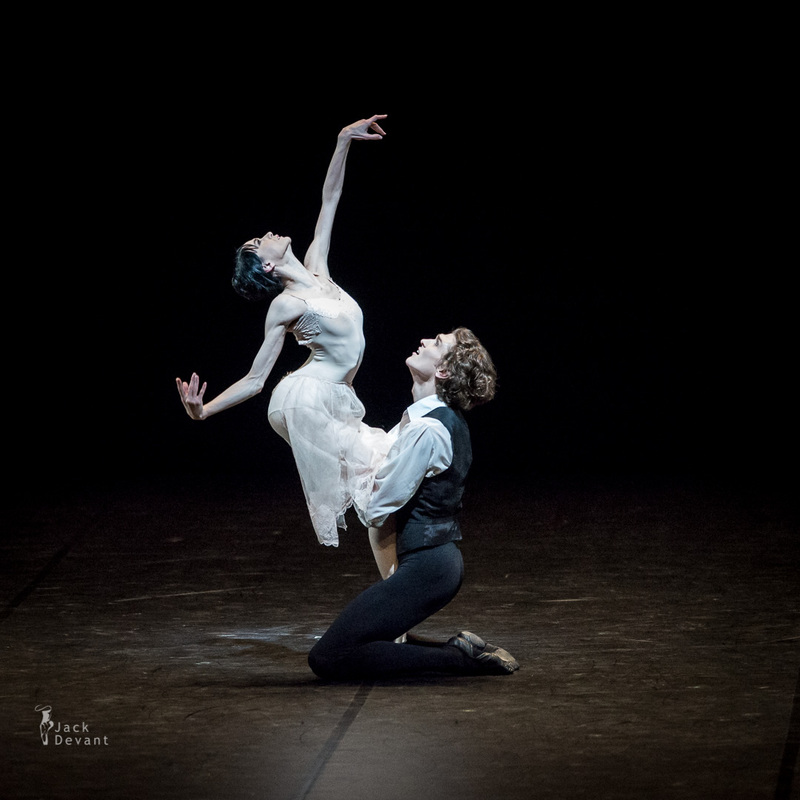 The Lady of the Camellias, Pas de deux by Lucia Lacarra, Marlon Dino, choreography by John Neumeier, music by Frederic Chopin. Taken on 20.1.2014, at Deutsche Oper Berlin, Malakhov and Friends — The Final ballet gala. Lucia Lacarra is dancing on Principal position at Bavarian state Ballet (bayerisches Staatsballett) She was born in San Sebastián, Spain. She knew from earliest childhood that she was born to be a ballerina. When in her small Basque hometown a studio was opened that she was able to begin with lessons at 10. Soon she was sent to a summer course directed by Rosella Hightower. There Lucia´s mother was strongly advised to support her daughter’s obvious talent. So she was sent to San Sebastián to Mentxu Medel who worked with Lucia for three years in a completely unselfish way to prepare her for the audition to Victor Ullate´s school in Madrid. Already in her second year there she was given a contract to the Ballet de Victor Ullate. She was just fifteen when she danced Balanchine´s Allegro Brillante. In the course of four seasons this was followed by Concerto Barocco, Fokine´s Les Sylphides, four works by Hans van Manen, Nils Christe´s Before Nightfall, as well as four pieces by her mentor Ullate who gave her the necessary self-confidence. In 1994 she joined Roland Petit´s Ballets de Marseille as principal. Petit immediately entrusted her with the role of Esmeralda, with Patrick Dupont as her partner, in Notre Dame de Paris, replacing Dominique Khalfouni. From Roland Petit she learned above all to always be emotionally present on stage and she felt that in this company everything was danced in a somewhat more classical style. Within three years she danced the leading roles in seven ballets by Roland Petit, four of which were created on her, most notably Angélique in Le Guépard and, as partner of Nicolas Le Riche, in the famous Le Jeune homme et la Mort. In her pursuit of classicism she then decided to join the San Francisco Ballet. Under the direction of Helgi Tomasson she could dance Giselle, Swan Lake, The Sleeping Beauty for the first time, i.e. some of the classical roles that a young ballerina has to master. The Cage, In the Night and Dances at a Gathering by Jerome Robbins became part of her repertoire, as well as six Balanchine ballets, from Serenade to Jewels, and Victor Gsovsky´s Grand Pas Classique, three ballets by Helgi Tomasson, MacMillian´s The Invitation, van Manen´s Black Cake, Nacho Duato´s Without Words, Roland Petit´s L’Arlésienne and Desdemona in Lar Lubovitch´s contemporary Othello. Lucia Lacarra has joined the Bayerisches Staatsballett with the 2002/2003 season in order to return towards the leading European choreographers. Marlon Dino is currently principal at Bayerische Staatsballett. He was born in Albania and trained at the School of Choreography and Ballet in Tirana. In 1998 he joined the Genève Dance Center under the direction of David Allen. Thereafter in 2001 he danced for the Ballet of the Vienna State Opera. He became member of the Corps de ballet of the Bavarian State Ballet in 2002, where he danced a solo part in Jiří Kylián’s Six Dances. He was promoted to soloist in autumn 2005 and at the beginning of the season 2007/2008 to soloist. During the season 2009/2010 he became principal dancer. Photo by Jack Devant ballet photography © with kind permission of the Staatsballett Berlin and Vladimir Malakhov. Special thanks to Eva Czaja.